Three seperate drawers for organizing and storing valuables. Plans drawn FULL SIZE. 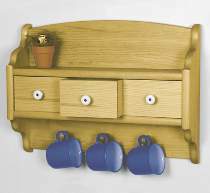 Measures approximately 14"H x 20"W x 5"D. Order knobs and shaker pegs separately below.